Shortcuts are a very important feature of any operating system. We use them to launch programs and our Internet Explorer favourites, or we can use them to make our computer perform set tasks. In my job, I find myself regularly being asked how to make shortcuts. I would normally first advise users to get rid of the unnecessary links to readme files and uninstallers so that their utilities stand out more. Saying that, shortcuts are really easy to make and are sometimes necessary. As shortcuts are used in every operating system, I thought I would have a look into them a little further and try to get some creativity going so that we can get the most out of our shortcuts. Over the past week there have been a number of great posts around the blogosphere about how to make shortcuts to do certain tasks. These inspired me to write an article that would allow you to get your shortcuts to work for you more effectively. In this article, we will create shortcuts to a handful of little utilities, existing Windows utilities and Windows features. The end result will be an easily accessible group of shortcuts that can be launched quickly and without hesitation. By the time you have finished reading this article, you should have a workforce of shortcuts ready to be used with a single click. You have one location to access them all. It is sort of like having your own customised control panel on hand. While there is not much in this article that is new, we are bringing together a few techniques that I hope will open up your creative side. Each persons needs are different and as a result, each persons shortcuts should be different also. There are a number of places where we can store our shortcuts. Outlined below are some advantages and disadvantages of using certain locations. Start Menu: The start menu is a good place to store your shortcuts. It is the logical place to launch applications from. You can create a new folder in the start menu for your shortcuts. Taskbar (quick launch): This is an ideal place to store your shortcuts so long as you don’t have a lot of them. The taskbar is easy to get to, so it is a great choice. If you do have a lot of shortcuts, you could put them in a folder and create a single shortcut to that folder from the tasktray. Desktop: It is always nice to leave the desktop tidy. That is one of the reasons I like to make shortcuts in the first place. I recommend trying to keep your desktop clear of everything bar your recycle bin, and maybe a shortcut to your documents folder. IE Favorites: Sure you can save shortcuts in here but it would not be useful for most of the shortcuts we are looking at in this article. Another location: You can place shortcuts just about anywhere on your hard drive. I would try to stick with one of the above options as this will help keep your computer tidy. A folder of all your shortcuts in your documents folder may help you if you want to ensure they are backed up. Third-Party Applications: I was hoping to find a Vista Sidebar gadget that would launch shortcuts. I didn’t find one that would suit my needs. There are a lot of application launchers out there which may work for you. I chose the tasktray as I did not end up with many shortcuts. The tasktray is easy to get to and the icons look alright in there. The lower icons are shortcuts I created for this article, and they are going to stay there. To create a shortcut, right click on the desktop or the location you want to place the shortcut. Click “New”, and select “Shortcut”. Then it is just a case of naming the shortcut and entering the correct command line, followed by any other relevant arguments. Alternatively, you can find the executable file, right click on it and select “Create Shortcut”. Then it is a case of going into the properties of the new shortcut and altering it to suit your needs. You will then need to copy the shortcut to the desired location. Shortcuts are great as they can easily be copied from one location of your computer to another, and depending on your setup, you might be able to transfer them between computers. You could have a whole swag of these shortcuts, which you can shuffle around. Each control panel applet can be launched from outside the control panel. There are many of these applets that we don’t use very often but the occasional one we use quite frequently. I often go into my sound devices, folder properties, and on my laptop I use the power settings. Why not add some of these to your fleet of shortcuts. Create shortcuts in the following format, using “control applet.cpl” as the target. Windows itself includes a lot of utilities that do various tasks. Things like launching screensavers, shutting down and much more, can all be done through utilities built into Windows. The How-to Geek is on the ball and has put together an article explaining how to setup shortcuts which will let you shutdown and hibernate your computer. Check it out here. He also has an article on how to launch Vista screensavers from a shortcut but it may be better to use flipss which I will mention a little further down. It is worth having a look at here. There are many more examples available of Windows utilities that can be launched from shortcuts. Disk Management or ipconfig (to renew) are a couple more examples. Many websites, including this one, promote little utilities that we hope will add to your computing experience. Some may suit your needs while others may not be appropriate for you. We don’t want these little utilities to fill up our start menu. Many of them require command line arguments to make them do what you want, so what better way to launch them than making a shortcut with the arguments built in. There are two main types of utilities that we use. The first type are the utilities that load at startup. This includes things like VNC, network clipboards or call ID software. Once they are set in startup, we need not worry about them anymore as they will always be running. The second type of utilities are programs that we manually launch to achieve a task. 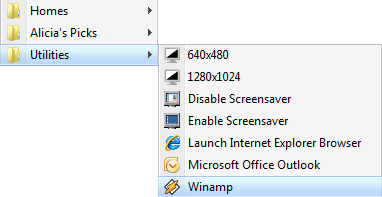 This includes programs which will change screen resolution or turn on screensavers, and there are many more. These are the type of utilities we will concentrate on today. There are hundreds of these little utilities available for free so there is a good chance you will be able to find one to do just about any task you want. Pick some of the utilities below or use your own. Reschange: Reschange will let you change your screen resolution quickly. It requires you to either launch it through a command line with arguments or create shortcuts of the various resolutions you want. The latter is much more practical. I switch between 640×480 and 1280×1024, so I created two shortcuts so that I can switch quickly. Flipss: Flipss will let you enable or disable your screensaver. It will stop those annoying times when you are watching a movie and the screensaver kicks in. Once you have create the correct shortcuts for this utility, this problem will no longer plague your computer. Basically, create a shortcut to flipss with either /on, /off, or /start switches. For more information on this, including how to make the correct shortcuts, please visit The How-To Geek. Remote Desktop Client: You can create shortcuts that will automatically connect to any number of computers remotely. This is a much quicker method than opening up the program and entering in all the information each time. For more information on this, including how to make the correct shortcuts, please visit CyberNet. As you can see, just a few small, yet powerful utilities allow you to do all sorts of stuff. You don’t necessarily need to install software to start experimenting with these things. We normally have a few documents that we use regularly. They may be a PDF of a directory or a reference manual that we use frequently. Don’t hesitate to select a few of these and then put them in your quick launch area. The same could be said for websites that you visit frequently such as your workplaces phone directory. Creating a shortcut and placing it in the quick launch area will save you from opening up your browser and navigating through your favourites. Shortcuts to documents are often a cause of desktop clutter. Most of them are usually unnecessary. It is important to be very selective when we make shortcuts to documents. All of the above command lines can be put into batch files so that you can run multiple utilities with one click. This could be useful if you make large changes to your setup to watch a movie. i.e, turn off the screensaver and change the screen resolution. I will save this for another day. It’s an article in itself. I hope that you have enjoyed this article and got something useful out of it. Please stick around and check some other articles at Inspect My Gadget. Nice roundup article, and thanks for the links!